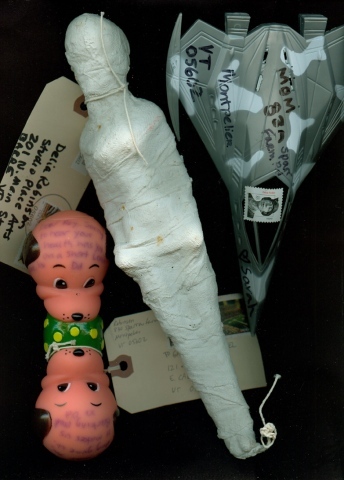 The mummified Barbie was a 4th grade project by my daughter Saree Robinson. After taking part in a couple Mail Art exhibits, Barbie returned to her cardboard sarcophagus. The futuristic plastic jet was also Saree's contribution, addressed to "MOM." The dog toy is inscribed with two letters, one at each end. One says, "Dear Gabrielle, We woof you, dog gone it, and it makes us barking mad." The other says, "Dear Roy, Sorry to hear your health has you on a short leash." Clearly written by the pug.